Summary: From the New York Times bestselling author of Whiter Than Snow and Prayers for Sale comes a novel about the secrets and passions of three generations of women who have all lived in the same Victorian home called the Bride’s House. It’s 1880, and for unassuming seventeen-year-old Nealie Bent, the Bride’s House is a fairy tale come to life. It seems as if it is being built precisely for her and Will Spaulding, the man she is convinced she will marry. But life doesn’t go according to plan, and Nealie finds herself in the Bride’s House pregnant---and married to another. Susan is the latest in the line of strong and willful women in the Bride’s House. She’s proud of the women who came before her, but the Bride’s House hides secrets that will force her to question what she wants and who she loves. I should start this review by stating that I am a pretty big Sandra Dallas fan. I have read all of her books (except one but I do own it!) and I love her blend of history, unique settings and special characters. So when I learned that Ms. Dallas has a new book out called THE BRIDE'S HOUSE, I jumped at the chance to review it! I don't know if I'd go so far as to say that THE BRIDE'S HOUSE is my all-time favorite Sandra Dallas novel, but I still enjoyed it a great deal. It does have all the elements that I've come to know and love about her books including interesting settings, dynamic (and very complex) characters, and an intriguing storyline. I appreciated how this novel covered three generations of women, and I liked seeing how the times changed for women through the years. I also really liked how Ms. Dallas decided to tell the stories of Nealie, Pearl and Susan. The book is divided into three sections -- one for each of the women who lived in the Bride's House. I thought she did an excellent job of developing the individual characters too. Despite being grandmother, mother, and daughter, all three women were very different in how they approached life and their relationships. However, there are similarities between the women (I guess they were hereditary) that readers will recognize. What I found different about THE BRIDE'S HOUSE than some of Ms. Dallas' other novels is that it took me awhile to get really caught up in the story. The first section of the book was about Nealie, and while I did think Nealie was interesting (and a bit funny), I had a hard time warming up to her character. Having said that, I think the book definitely picked up after that first section and I found myself genuinely liking the other two women. (One thing is for sure -- my heart went out to each of these women!) I especially enjoyed the last section because there were so many secrets of the Bride's House revealed -- some of which I found quite surprising. I have to say that I did appreciate many of the themes of THE BRIDE'S HOUSE. I absolutely loved how Ms. Dallas brought the house itself to life and it actually became quite powerful as another (almost) character in the story. In addition, I loved how the book looked at all sorts of relationships -- husband/wife, mother/daughter, father/daughter, etc. ; and I found it very interesting to see all of the ways that love presented itself in this story. The inspiration for THE BRIDE'S HOUSE was another one of my favorite things about this novel. A few years ago, Ms. Dallas and her husband bought a derelict house in a once-elegant mining town home in Georgetown, Colorado. A preservation architect declared it a Bride's House because of ornate staircase. Over three years, Ms. Dallas and her husband renovated the house restoring it to its once elegant state. Ironically, the novel THE BRIDE'S HOUSE also took Ms. Dallas three years to write! As is the case with all of Ms. Dallas' novels, THE BRIDE'S HOUSE definitely would make for an interesting book club discussion. I imagine you could discuss the actions of the three main female characters (as well as some of their male counterparts) for hours. However, there are also some other interesting themes to explore including the role of a mother, mother/daughter relationships, marriage, love, duty/obligation, war, control, and secrets. There is a reading guide with 12 very intriguing questions to help facilitate your discussion. 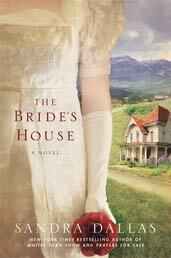 I recommend THE BRIDE'S HOUSE to fans of Sandra Dallas as well as readers who enjoy multi-generational family sagas. The book sounds interesting and true to life. I bet if we really thought about it, we'd each discover that we're like our ancestors even though we're each unique in our own way. I've had Prayers For Sale on my iPod for ever (a year, year and a half?). I started it right after I finished The Angel's Game, and couldn't transition from brutality to the calm of Dallas, so I quit, and I haven't been back. I need to give that another try. I've been a fan of Sandra Dallas' books for many years. I was glad to see a new one from her and I'm intrigued by the story. I read that she had bought a house like the one in the story and was renovating it. I think there might be pictures on her website - I believe that's where I saw them. Looking forward to reading this one. I like the idea of following three generations of women through their relationships. I also love the back story of the novel - how the author has her own Bride's House! Cute! I really like Sandra Dallas. Prayers for Sale was a wonderful book. I'm really looking forward to this one. Glad to know it's another good Dallas story. I am so jealous that you got to read this one. I am also a huge Sandra Dallas fan. My favorite so far is Tallgrass, but I still have a few to read. She's going to be visiting here in a couple of weeks and I'm planning on going. I hope I don't go too "fan girl"!